I get such a kick out of the names of Chicago Hot Dog joints: Mustard’s Last Stand; Wiener and Still Champion; Superdawg; Flub A Dub Chub’s; Red Hot Ranch; Hot Diggity Dogs; Relish the Thought; Dear Frank’s; and U Daw U, to name a few. (See Vienna Beef’s Hall of Fame for a few more.) But one of our most famous, Hot Doug’s, is set to close today. and Encased Meat Emporium,” Doug Sohn. Whether you like hot dogs, or not, it’s well-worth a read – Pang’s questions are respectful, clever, and out-of-the-ordinary. And Sohn’s answers are thoughtful, grounded, and delightful. Clearly, he’s a man at peace with his decision. 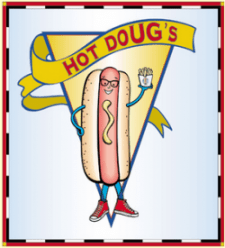 Here’s the link to Hot Doug’s The Exit Interview. Enjoy!